Imperial Esso was the owner of the planet's worst single pollution accident when the EXXON Valdez ran aground in the Alaskan panhandle. That was a spectacular and well publicized accident but dangerous pollution lurks beneath several sites here in Tisdale. 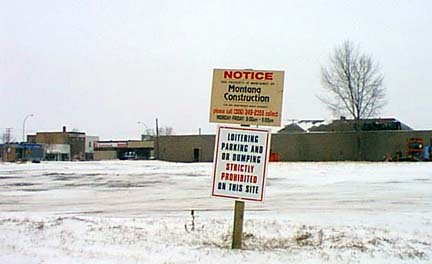 The picture above is a site owned and fenced off by Montana Construction (aka Imperial Oil). This site is contaminated and the company will make no effort to sell the property because of the very high costs that would be incurred to clean up the buried contaminants. company but was at one time the site of a fertilizer distribution centre and is not known to be contaminated. decided it was to costly and the reclamation of of the site was halted. above it. For this reason you could not obtain a mortgage to build on such a site and for possible lawsuit potential Imperial Oil will not sell this property. The former GT Mechanical building will be torn down as soon as SGI okays its demolition but the property it is on can not be sold for it also once had underground fuel tanks and that property is not economically reclaimable. When Seven Eleven took over the corner property they now operate they installed new fuel tanks in the ground but did not remove all the old ones. Rather then go to the relatively minor expense of digging up the old tanks they merely had them punctured and filled with backfill. Seven Eleven's concern about possible leakage remains high as they have had to soil around their site tested several times to monitor underground contamination. 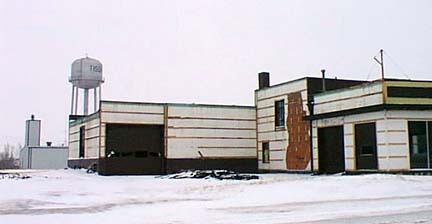 The picture below was also once a service station and it is on the list of contaminated Tisdale properties. All in all it looks like a considerable amount of the Southern part of the town's land mass is dangerously contaminated. Problems like these do not go away on their own and it is surprising that we are going into the new century with these pollution problems going largely ignored.